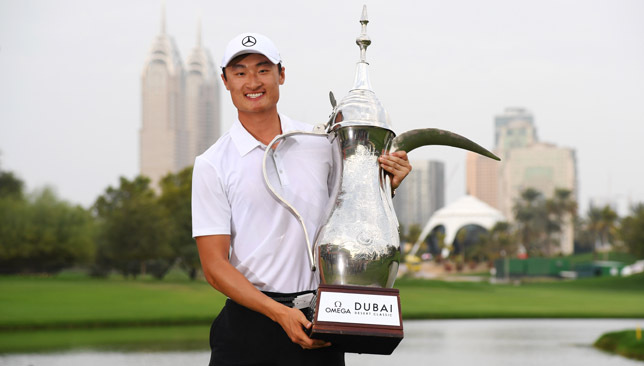 China's Haotong Li is the reigning champion in Dubai. 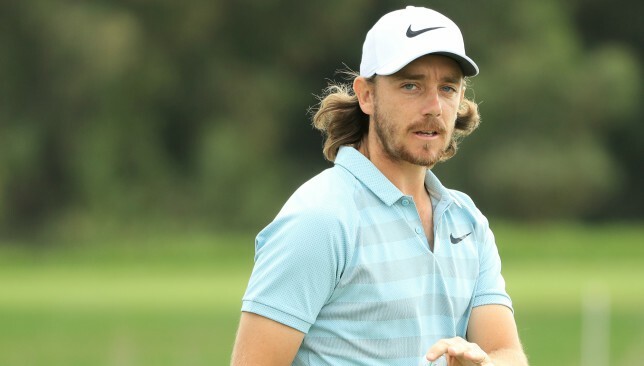 European Ryder Cup star Tommy Fleetwood has confirmed he will play in the 2019 Omega Dubai Desert Classic, reinforcing its status as the Major of the Middle East. Fleetwood will be joined by fellow Ryder Cup stars, past and present, including Sergio Garcia, Henrik Stenson, Ian Poulter, Tyrrell Hatton, Thorbjorn Olesen, Thomas Bjorn, Lee Westwood, Miguel Angel Jimenez and Colin Montgomerie, in what will be a star-studded field as the world’s best compete for the famous Dallah trophy. Omega Dubai Desert Classic 2017 champion Garcia triumphed earlier this year as the all-time highest points scorer in Paris, becoming the most successful Ryder Cup player in history. The Spaniard was the second Omega Dubai Desert Classic champion who then went on to win The Masters, after Danny Willett accomplished the same in 2016. In a twist of fate, both Garcia’s and Willett’s caddies were assigned the No89 – the same year the Desert Classic was born. Will lucky number 89 be victorious again in 2019? Reigning champion Haotong Li will return to Dubai to defend his title and look to secure back-to-back wins. The 23-year-old from China became the first Asian golfer to win the event in 2018 when he beat four-time Major winner Rory McIlroy by one stroke. Fleetwood will be one of the stellar names competing. European Tour Rookie of the Year 2018, Shubhankar Sharma, is confirmed to join fellow UAE-based amateur Rayhan Thomas as well as Jovan Rebula, the British amateur champion and nephew of the only three-time champion, Ernie Els. Current No1 in the Race to Dubai rankings, Aaron Rai has his sights on the famous Dallah trophy along with Rafa Cabrera Bello, Louis Oosthuizen, Eddie Pepperell, Matt Fitzpatrick, Matt Wallace and Andy Sullivan. David Spencer, tournament director, said: “We are looking forward to ensuring that our 30th edition continues to enhance Dubai’s growing reputation as a world class golfing destination. His Highness Sheikh Fahim bin Sultan Al Qasimi, from the Emirates Golf Federation, added: “The Omega Dubai Desert Classic has become one of the most famous golf tournaments in the world. Rory McIlroy is a two-time winner of the event. Spectators will be able to enjoy a range of exciting new additions to the tournament for the special 30th edition, including a brand new viewing platform on the 18th green, new spectator area on the 15th hole and a redesigned tournament village. With so much on offer, fans can take advantage of the event’s special 30th edition offer where they can enjoy a full four-day experience for only Dh250. The 30th edition of the Omega Dubai Desert Classic will be held at Emirates Golf Club from January 24-27, 2019. Since 1989, the tournament has seen 24 different winners, including nine Major champions and 13 different nationalities. For tournament information, tickets and hospitality packages, visit the tournament website www.omegadubaidesertclassic.com. 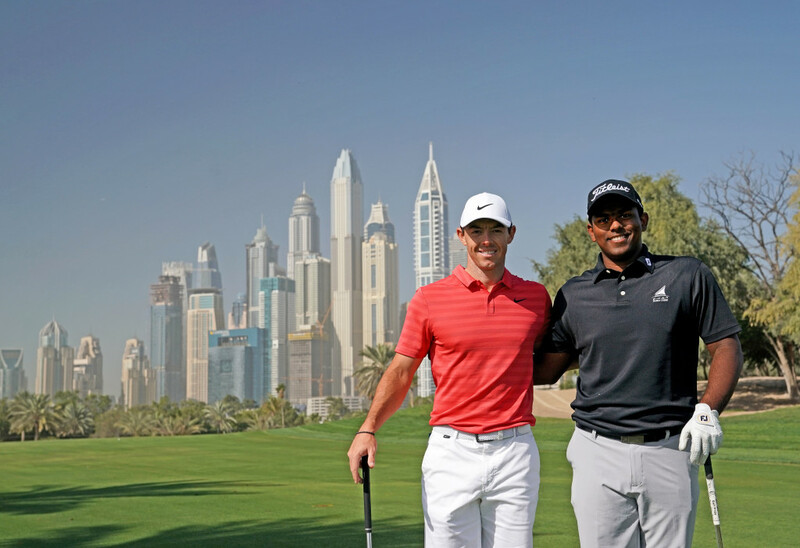 Rayhan Thomas and Rory McIlroy pictured playing on the Majlis Course at Emirates Golf Club. 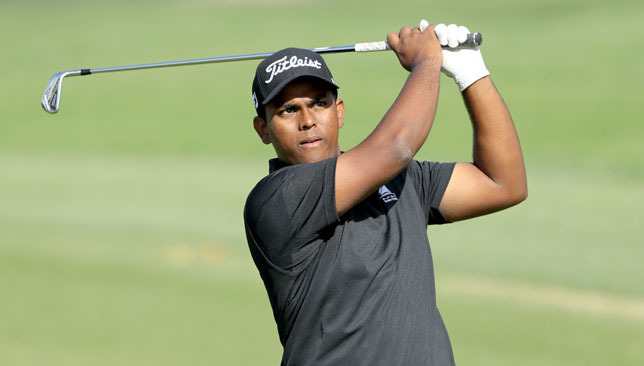 Amateurs Rayhan Thomas and Jovan Rebula have been confirmed to play in the region’s premier golfing event, the 2019 Omega Dubai Desert Classic at Emirates Golf Club, from January 24-27. 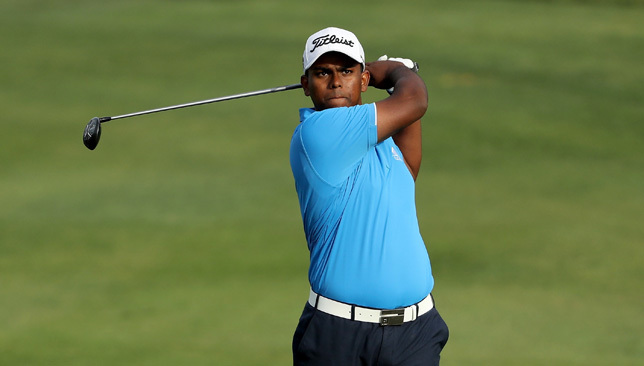 India’s number one amateur, Rayhan Thomas, will return to the Omega Dubai Desert Classic for the third time. The 19-year-old Dubai-based Indian amateur first took part in the 2017 Omega Dubai Desert Classic where he made his first European Tour cut following an opening round of 68. Thomas has had some strong performances in 2018, winning the King Hamad Trophy as well as finishing second in the Asia-Pacific Amateur Championship. Thomas commented: “It is a great honour to be invited to play in the tournament. Nephew of the only three time Omega Dubai Desert Classic Champion Ernie Els, Jovan Rebula, will make his European Tour and Middle East debut in January 2019. The 21-year-old rising star from South Africa made a significant jump in the World Golf Amateur rankings, moving from 192 to 59 after winning the British Amateur Championship this summer, becoming the first South African to win since 1966. As well as securing him an invite to the Omega Dubai Desert Classic, the win earned him spots in the Masters and U.S. Open Championship in 2019. “Being invited to play in such an iconic tournament is a huge privilege. I am really looking forward to the Omega Dubai Desert Classic being my first European Tour event, especially as the tournament holds so much history for my uncle,” said Rebula. Since 1989, the tournament has seen 24 different winners from 13 different nations. For tournament information, tickets and hospitality packages, please visit the tournament website www.omegadubaidesertclassic.com. After playing a round of golf with four-time major winner Rory McIlroy ahead of the Dubai Desert Classic last month, Indian golf sensation Rayhan Thomas says he dreams of one day winning the prestigious tournament in his home city. The 18-year-old received a belated birthday present in January when he enjoyed a leisurely nine holes with Northern Ireland’s McIlroy – a two-time champion in Dubai – while also receiving a sponsor’s invite to play at Emirates Golf Club. 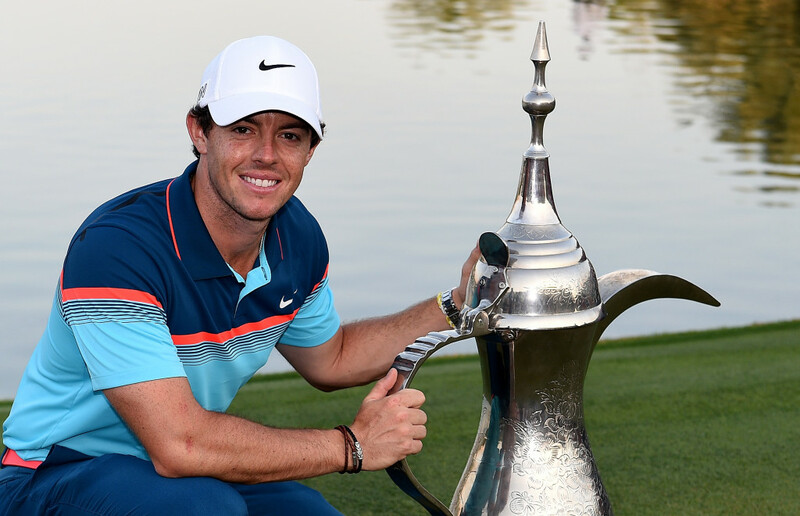 And a European Tour win at Emirates Golf Club in the future is a burning ambition for Thomas. “That would be a home open for me or the Indian Open. To play in the Classic and get a win there one day as a professional, that would be awesome,” Thomas, the world number 1,053, told Sport360. After a host of superb wins in the previous two years on the amateur circuit, including winning the 2016 Dubai Creek Open in the city he has called home for most of his life, many are anticipating when Thomas will likely turn professional. But the man himself admits that remains some way in the future, with the talented youngster eyeing college in America first in the autumn of 2019. Wise head on youth shoulders: Thomas. Thomas, who turned 18 last November, has accepted a scholarship to the famed Oklahoma State University, whose alumni include world number seven Rickie Fowler and number 16 Alex Noren, as well as a host of other stars like Hunter Mahan, Peter Uihlein and Bo Van Pelt. And with turning pro a goal eventually for Thomas, he insists Oklahoma is the right place to further his development. “It was my first choice and when they came in and said they were interested I jumped on the wagon,” said Thomas, who heads Stateside in September 2019. Darren Clarke, winner of the 2011 Open Championship and 2016 European Ryder Cup captain, described Thomas as a “huge talent” last September after the MENA Tour prodigy fired a magical 10-under 61 – including nine birdies in a row – in the second round of the Dubai Creek Open. He eventually finished tied for second as the tournament’s defending champion, but admits he’ll play more amateur events in 2018. “I’ll be playing a lot of amateur stuff this year, we’ve got the Asian Games coming up which I want to qualify for,” he added. “There’s the Eisenhower Trophy too I want to try and qualify for and the British Amateur. At the Gary Player Invitational in Abu Dhabi last month, he featured alongside this year’s European Ryder Cup captain Thomas Bjorn, as well as legendary nine-time major winner Player himself. And even in the more relaxed environment, Thomas said he was still absorbing useful information. Learning from the best: Rayhan Thomas with Rory McIlroy.